Fish oil — you should discuss fish oil with your doctor. And the reason you should discuss fish oil with your doctor is that there’s recently a clinical study, a select trial, they took 35,000 men aged 55 and over, they watched them over the course of ten years — actually eleven years — and after eleven years, 2% of them had prostsate cancer. So they took those 2% with prostate cancer and they compared their blood levels of omega-3 fatty acids which are essentially fish oil, to those people who didn’t have prostate cancer and they said, “Oh, it looks like it’s high.” So if you have prostate cancer or prostate problems, ask your doctor before you take fish oil. Women do not have a prostate, so women don’t have to worry about it. Fish oil is good for you because omega-3 fatty acids are anti-inflammatory. Omega-6 fatty acids, which are another fat found in meat, are inflammatory. This is interesting. Lots of doctors recommend you take fish oil supplement, and the reason they do is they say, “Americans don’t get enough omega-3s.” Why don’t you get enough omega-3s? It’s because the beef that we eat today is all corn-feed beef, it comes from feed lots. And corn-fed beef from feed lots has twenty times the amount of omega-6 fatty acids as it does omega-3s. You take that same cow and you put that cow on grass – grass-fed beef – cows are made to eat grass. And their ratio of omega-6 to omega-3 is closer to 1:1. So Americans are deficient in omega-3 fatty acids, not because we don’t eat enough fish but because the cows we eat are eating too much corn. So that’s why I recommend you take fish oil. I also recommend you buy grass-fed beef, and we’ll talk about that, it’s in your handout. Tryptophan — if you’re feeling kind of depressed, tryptophan is what’s found in turkey and tryptophan is what your body uses to convert into serotonin and if you’re feeling a little down, you’re feeling a little depressed, you can take tryptophan. And then the last supplement, this is L-glutamine. L-glutamine helps with sugar cravings and wheat cravings. And so if you feel like you have a sugar craving or a wheat craving, in the Atkins book he recommends you take a little spoonful of L-glutamine – the measurements I think are in the handout – you take that and put in some heavy cream and drink it to get rid of your sugar cravings. If you want breads without the carbs, you’re gonna have to bake. For me personally, I don’t really miss the bread that much. But my wife, she loves pancakes and waffles, she loves donuts and muffins, so for her, it’s important that she finds a way to cook them. And I would use the Wheat Belly cookbook, and I would use a flour like almond flour with 9 carbs per cup instead of wheat flour with 92 carbs per cup. The reason you avoid corn and corn mill is that it still has 72 carbs per cup. This chickpea, garbanzo bean flour, at least it’s half of wheat. Coconut flour is an excellent thickener, and ground flaxseed has almost zero carbs per cup. You all have to learn to cook something new. And anytime you cook, if you’re gonna go through the trouble of cooking something with these ingredients, make a lot and freeze them. That way you have an extra loaf of bread, you have extra cookies to eat, because it’s a lot of trouble to bake and nobody has time to cook all the time. It takes the same amount of time to make one loaf of bread and put it in the oven as it does to make four loaves of bread and put those in the oven. Because your oven time’s the same and your mixing time’s the same. Maybe it takes two percent longer. So if you’re gonna go through the trouble of doing this stuff, make it and freeze it. Double and triple recipes, that’s what we’re talking about. If you wanna eat low carb use lettuce — wrap anything you want in a tortilla in lettuce. If you’re trying to avoid wheat completely because let’s say you have irritable bowel syndrome or you have colon problems or you have allergies. Then in that case you have to be very careful because wheat can go by a thousand different names on packaged foods. And you should look at the book Wheat Belly by William Davis, because he has a list in the back of all the different names that wheat can go under. Gluten-free doesn’t mean low carb, we talked about that, ’cause sometimes they use starches which are actually worse for your blood sugar than wheat. And use the alternative flours for baking such as almond flour, coconut flour, garbanzo bean flour. You have a lifetime of un-learning to do, and you can do that by starting to read some books, and you can pick whichever book you want but this Slim Now, Slim Forever by Craig Beck, it’s really short. It’s kind of offensive; it’s written by a British guy. It’s kind of offensive — it’s insensitive, not offensive. It’s insensitive. 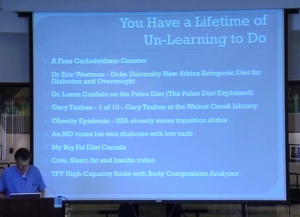 But the guy lost 60 lbs and he tells the story of how he did it eating low carb and he also talks about the subconscious mind — there’s a really good discussion of that. 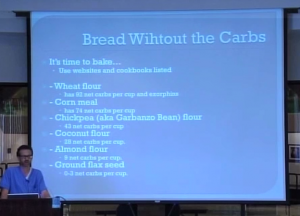 Wheat Belly goes in-depth about wheat and low carb. The Atkins Diet, any of the Atkins Diet books would be good, and if you need to be convinced by the science, if you have a scientific mind, and you’re like “It’s an interesting conference, but I don’t really believe the guy,” then read the books either Why We Get Fat or Good Calories, Bad Calories by Gary Taubes. And this book, if you’re suffering from allergies, chronic allergies or chronic digestive problems, you may read this book, Clean. This guy, Alejandro Junger, he’s a physician. He’s into colonics, which basically I think means enemas, and he’s into juicing. And I don’t agree with all his stuff but at least he puts you on an elimination diet. The elimination diet eliminates the foods that are most likely to be allergenic, most likely to bother you. and I’ve actually had patients who come with chronic allergies and I say, “Well, we’ll put you on an elimination diet where all you eat is these certain foods and about every 3 days you can add another food back to try and see what it is that’s the food causing your allergies. There’s another list of links and videos. This, I really encourage you to watch: Dr. Eric Westman, Duke University. I encourage you to watch that, you can watch it on Youtube, it’s free. 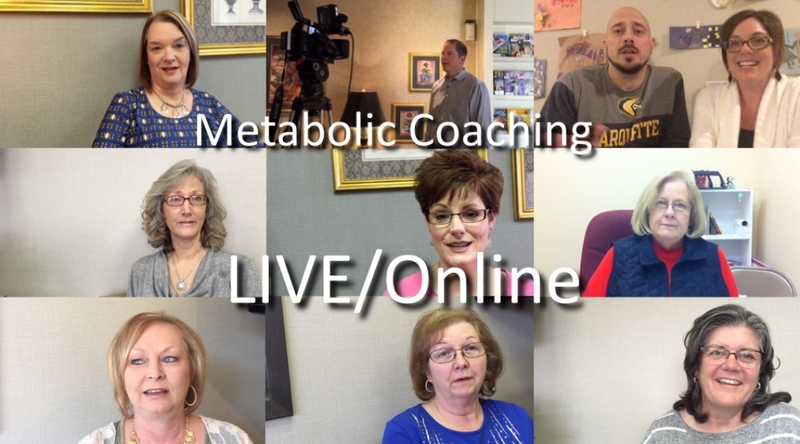 And the reason is, right at the beginning he says “Look, the first day you try this diet you have to cut your diabetes medicine in half.” And that was really powerful for me. I mean, think about that. If it costs Americans $500 million a year for diabetes medicine, in one day by changing the diet, you cut that number in half, that’s a big deal. There’s an interview of Gary Taubes – he’s the guy who wrote Good Calories, Bad Calories. An MD Cures His own Diabetes with Low Carb – that’s another good one. My Big Fat Diet Canada, I recommend you watch My Big Fat Diet Canada. So basically, when Dancing with the Stars is over, you open up your computer and pop in one of these deals because you’re trying to unlearn a lifetime of learning. I put this scale on here – high-capacity scale with body composition analyzer. Because what you’ll find, number one: as far as weighing yourself, you should weigh yourself about once a week. Your body weight can fluctuate day to day to day, so about once a week ought to be enough for you to see results that you’re losing weight. But what can happen sometimes is that you lose fat and gain muscle, that way your weight stays the same. 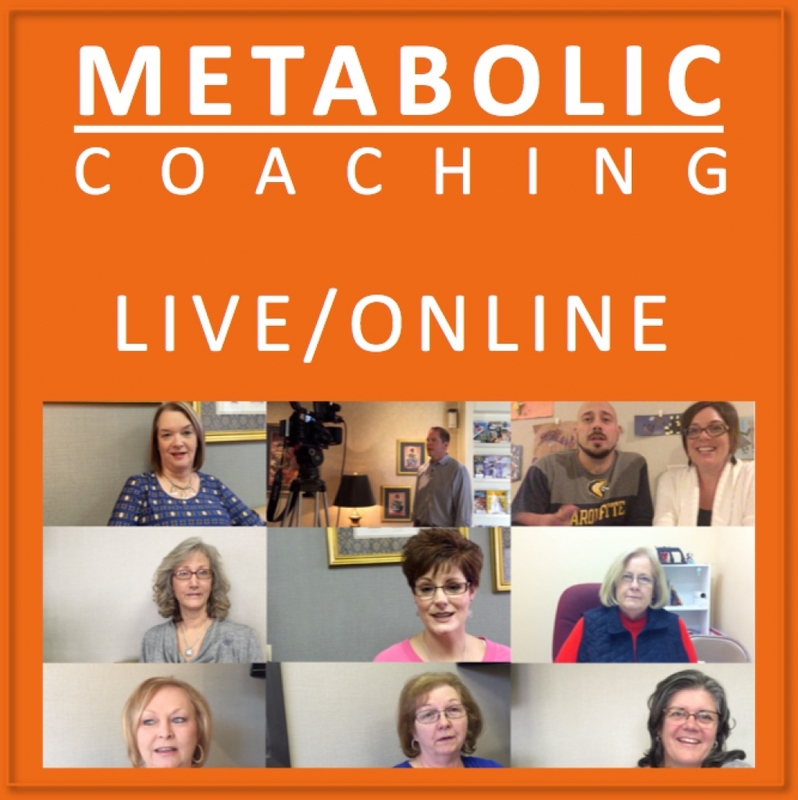 And if you lose fat and gain muscle and your weight stays the same you might say, “Oh, it’s not working, this diet’s not working.” And so one thing you can do is get a body composition analyzer. The other thing you can do is see how your pants fit. Because if you’re getting more lean muscle and you’re losing the fat, you’ll just notice, “Oh, my pants fit better,” and that way you don’t use any fancy body composition analyzer.